Just two years ago, Nokia brand was mostly present on feature phones and maybe some Lumia smartphones, then HMD Global happened and Nokia brand came back on the list of top 10 smartphone brands last quarter. Market research companies presented the results for Q1 2018 and stated that Nokia holds close to 1.3 % of the global smartphone market, but they predict that Q2 is going to be even stronger, because latest Nokia phones (like Nokia 6.1, 7 Plus, 8 Sirocco) are coming to the stores in Q2. Market research company Canalys released its data for the Europen market where Nokia climbed up to the 5th position in Q12018 on the top smartphone vendor list. On the first and second place are the strongest players in the game, Samsung and Apple, which lost some of their market share in Europe, actually, Samsung lost, even more, and it can blame Huawei and Xiaomi which are on the third and fourth place. Nokia definitely contributed to the slight downfall of Apple and Samsung in Q1, but it will be interesting to see the Q2 results, since Nokia 7 plus and new 6.1 could be this year’s hit smartphones. 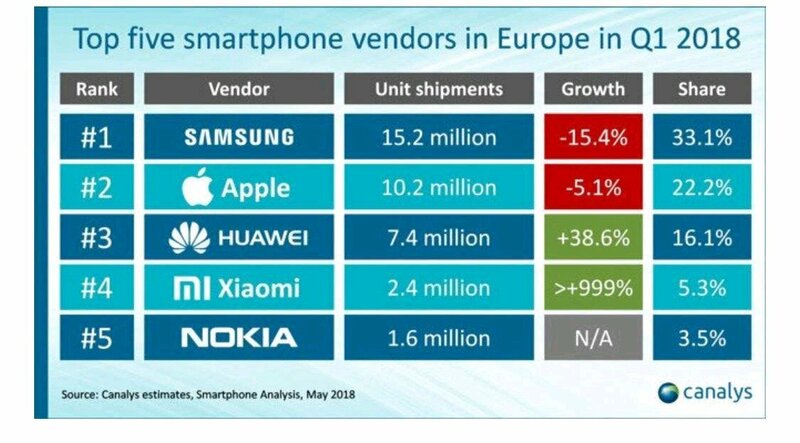 Nokia is currently holding 3.5% of the smartphone market in Europe, with 1.6 million phones sold, and it is slowly closing to Xiaomi which officially entered the Europen market this year. Xiaomi is a serious opponent and it won’t be easy for Nokia Mobile to overpass it. HMD still has few more phones to launch this year and 2018 will be the year that will decide the fate of Nokia brand. More good news for the Nokia brand come from Brand Finance, that announced that Nokia was the most valuable brand in Finland, and also the brand with the fastest growth last year, with a brand value of 7.1 billion euros. Moreover, Brand Finance expects the value of Nokia brand to continue to grow.